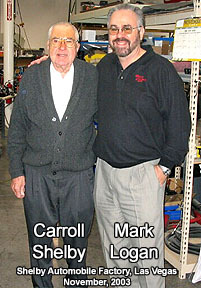 Interested in Authentic Shelby Cobra Component Cars? The CSX6000 Series 427 S/C Cobra from Shelby American improves on everything the 1965 model was famous for: 0-60 mph in 4 seconds flat, and sub 12 second quarter mile times. All this and now with even better handling! This new Continuation Series Shelby Cobra also boasts the world's first computer designed chassis with four wheel coil-over independent suspension. 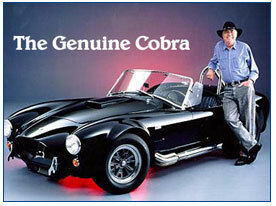 Like those built in 1965, Cobras are available with an aluminum alloy body, and now also with a fiberglass body. The heart of the CSX6000 is the notorious “FE” big block Ford 427 V8 in an awesome state of tune, and mated with either the original 4 speed “Toploader” transmission, or a Tremec TKO five speed. These are authentic Shelby Cobras documented by CSX chassis numbers, and a Manufacturer's Statement of Origin (MSO) from Shelby American. There are lots of improvements incorporated into these new cars including a stronger steel frame, better alloys used in the components, better cooling, and additional heat shielding, all while maintaining the character of the original Cobras built in the 1960’s. The updated chassis design improves handling and safety without sacrificing originality, and all that made Shelby Cobras famous. If you've ever wanted to own a true Shelby Cobra, now is the time. Why own a knock off when you can own the real thing, starting at $97,900 for a painted, finished, fiberglass body rolling chassis! Shelby Cars NW can put you in the seat of an authentic 1965 Shelby Cobra from Shelby American, Inc. Please take a minute to complete the following information. We would be happy to provide more information about ownership. Contact us for tour times at Shelby American in Las Vegas. We’re happy to arrange one for you! I'm seriously considering the purchase of a Shelby Cobra.